Fig. 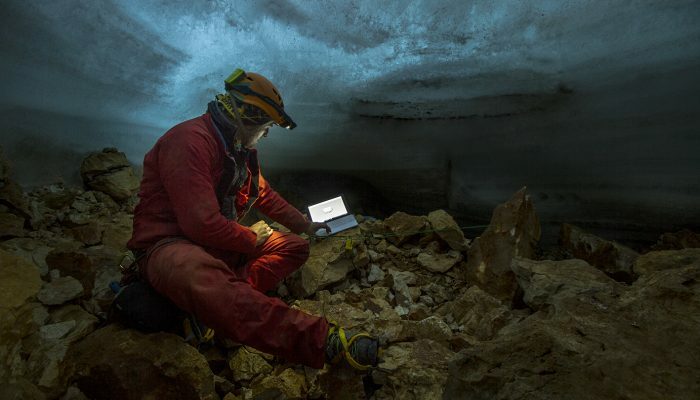 1: Downloading meteorological parameters in a cave of the southeastern Alps [Credit: Renato R. Colucci (selfie)]. The ice masses around the globe, in ice sheets, sea ice, and mountain glaciers, have been melting away in past decades (see this previous post). The reduction of the cryosphere, both in terms of area and mass, has particularly been visible in the European Alps over the last 30 years. On the one hand, large and small Alpine glaciers decline, fragment and even disappear, and this trend has accelerated since the mid 1980s. Mountain glaciers are therefore considered to be sensitive indicators for climate variability. On the other hand, the warming climate is also acting on permafrost degradation, mostly affecting the stability of rock-slopes and cliffs. What makes the international scientific community worry at the moment is how fast this abrupt glacial reduction is occurring globally. However, not all the natural environments respond in the same way to sudden changes in the climate system! Fortunately for us scientists, there are physical environments and ecological niches more resilient to external perturbations. This aspect has sometimes allowed the preservation of environments and information in the Earth’s climatic history that would have been otherwise destroyed. Among the most resilient natural environments there are caves, “protected” by the rocky mass within which they were formed. In the mountains, high-altitude karst cavities can contain huge deposits of ice representing a lesser known part of the cryosphere. 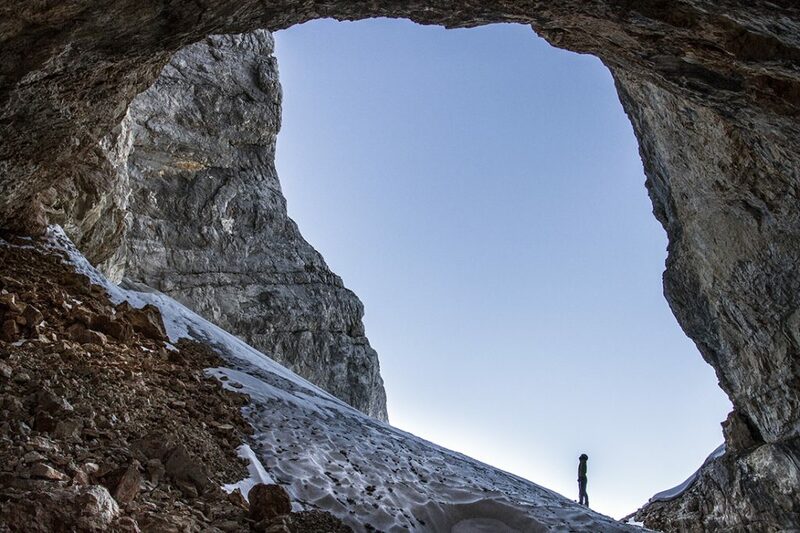 Speleologists face such ice in caves both as a joy and a damnation: fascinating by their beautiful shapes and morphologies, they also see it as an unwieldy presence that prevents explorations of still unknown voids in the alpine karstic systems. Fig. 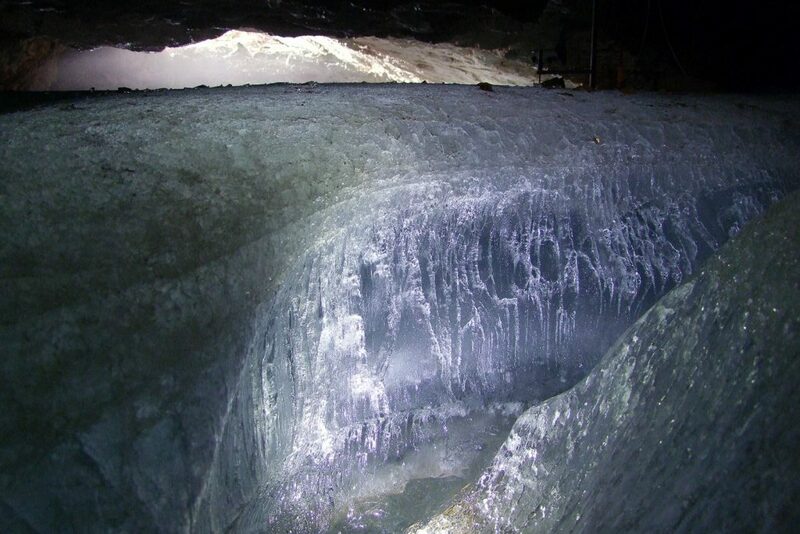 2: An ice deposit in a cave of the southeastern Alps [Credit: Renato R. Colucci]. But ice in caves is not just something beautiful (but isn’t it? Look at Fig. 2!). It rather represents a precious natural archive, sometimes with high temporal resolution, able to tell the climate history of large part of the Holocene (the last 11700 years of the Earth’s history). The permanent ice deposits, i.e. the ice staying longer than just a winter season, often defined in a colorful way as “fossil ice” by speleologists, is what counts the most. As it typically gets older than 2 years, which is one threshold for the general definition of permafrost, this phenomenon is part of the mountain permafrost… right or wrong, ice in caves is ground ice! Fig. 3: Huge entrance of a cave opening in the Dachstein limestones of the Canin-Kanin massif, southeastern Alps [Credit: Renato R. Colucci]. Generally in the Alps such ice deposits lie in caves having their opening at altitudes above 1,000 m (Fig. 3), but locally even lower. The formation of these unique environments depends on a combination of geomorphological and climatic characteristics, which allow for accumulation and preservation of ice also in places where this would be very unlikely. Now, although the caves are resilient environments, ice melting due to climate change is rapidly increasing there as well. This is why it is important to save as much information as possible from the remaining ice, before it is definitely lost! The C3-Cave’s Cryosphere and Climate project is under the scientific guidance of the National Research Council (CNR) of Italy, and precisely the climate and paleoclimate research group of ISMAR Trieste. It aims to monitor and study ice deposits in caves. Such ice deposits store several information related to the paleoclimate, the biology, the chemistry and ecology of these environments. Fig. 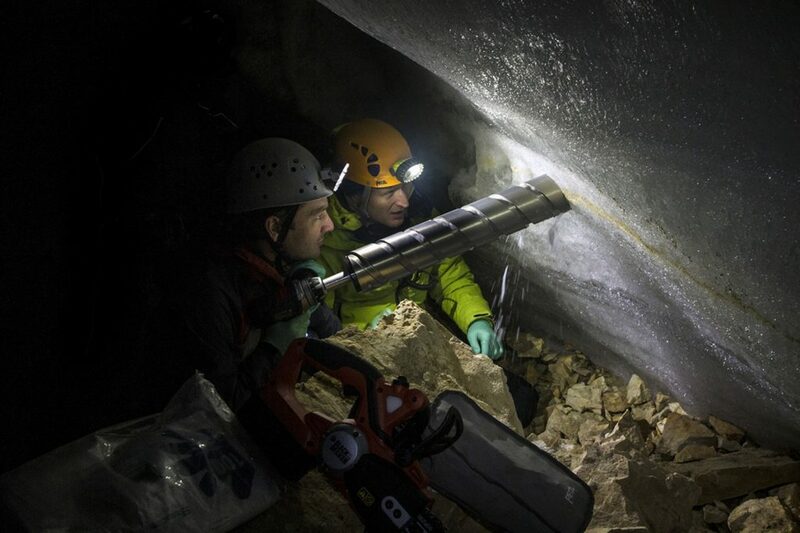 4: Drilling ice cores with the aim to extract the CCC layer from this ice body in a cave of the southeastern Alps [Credit: Arianna Peron]. The project started in 2016, following the discovery of a coarse cryogenic calcite deposit (CCCcoarse) in an ice layer (in-situ) in a cave of the Canin-Kanin massif, in the Julian Alps, located between Italy and Slovenia. This finding, representing the first evidence of CCC in the southern Alps, provides an important opportunity to understand the processes associated to the formation of these particular calcite crystals (Fig. 4). Previously, the CCC (Fig. 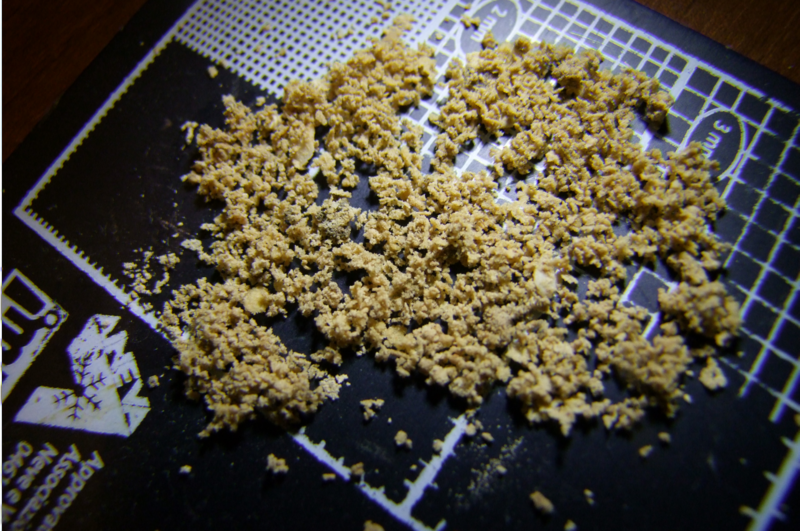 5) was only found on the floor in caves where ice had already melted away. What makes it interesting is the fact that it is possible to date these crystals using the isotopic ratio of some trace elements in radioactive materials, typically Uran and Thorium. Fig. 5: Millimetric crystals of coarse cryogenic calcite found in-situ in the southern Alps [Credit: Renato R. Colucci]. The strongest financial and logistic support to the project is given by the Alpine Society of the Julian Alps through its speleological group, the E. Boegan Cave Commission. In addition to the CNR and other Italian institutions such as the University of Trieste, University of Bologna, Insubria University in Varese, Milano Bicocca University and the Natural Park of the Julian Prealps, the project involves research institutes and universities from Germany (Institute of Physics of Heidelberg University), Switzerland (Paul Scherrer Institut; Swiss Institute for Speleology and Karst Studies), Austria (Innsbruck University; Palynology and Archaeobotany Research Group), and Slovenia (Geological survey of Slovenia). Many activities and several results already unveiled few of the secrets hidden in such environments: the realization of the first thermo-fluido-dynamic model in an ice cave, the development of innovative techniques for studying the mass balance of the ice, the study of the thermal characteristics of the rock and therefore of the permafrost and the active layer, the development of innovative and multidisciplinary methods of ice dating. But there is little time to do all, and we must exploit it to the fullest! Maggi V., Colucci R.R., Scoto F., Giudice G., Randazzo L.G. (2018): Ice caves in Italy. In Ice Caves 1st Edition. Perşoiu A. and Lauritzen S.E. (eds.) ISBN 9780128117392, Elsevier. 750 pages. Renato R. Colucci works in the climate and paleoclimate research group of ISMAR-CNR, Department of Earth System Sciences and Environmental Technology. 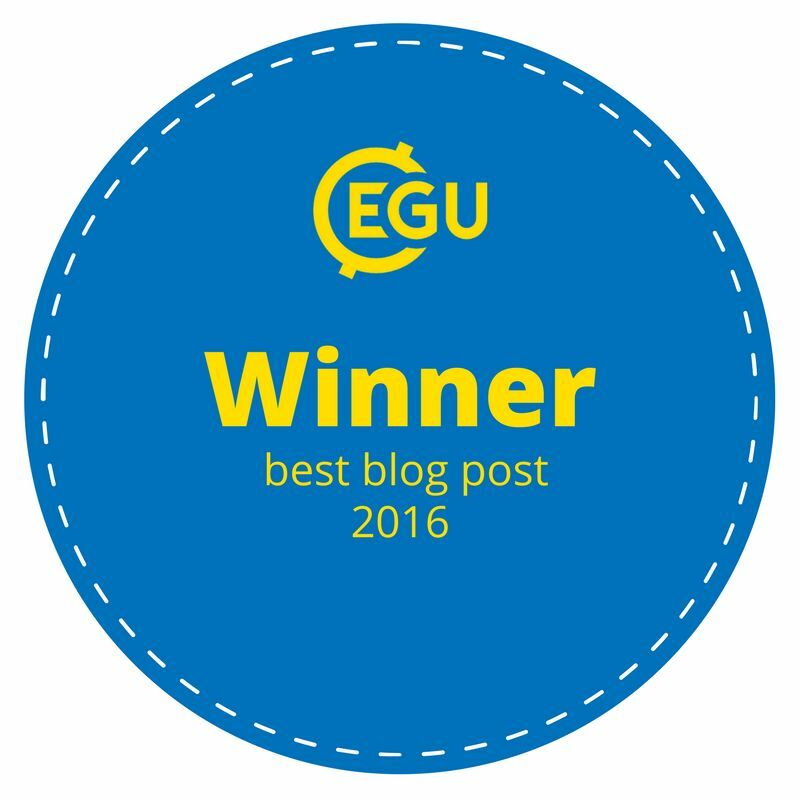 He is also adjunct Professor of glaciology at the University of Trieste (Italy). 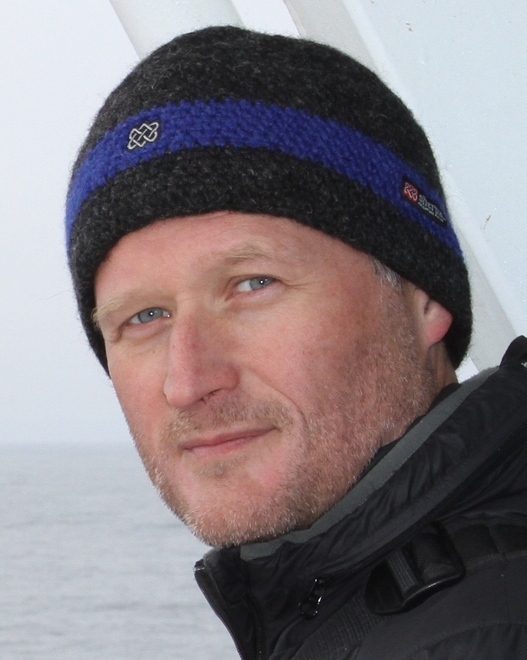 During his PhD he honed his skills in glacial and periglacial geomorphology at UNIS (University Center in Svalbard). His research centers around the interactions between cryosphere (glaciers, permafrost, ice caves) and the climate, spanning from the end of the Last Glacial Maximum to the present days. Image of The Week – The Ice Your Eyes Can’t See!